Business Planning – The Markens Group, Inc.
A successful strategy for the future cannot be implemented until your company’s vision has been carved, chiseled, and polished from the unformed stone of your culture. Finding your vision puts passion on paper and gives your organization direction and focus. In order to know what we can become, we must first understand what we are. So to better identify the current state of your company, we ask your key people—The Discovery Team—to take an online, anonymous survey. Originally designed by Gallup’s Marcus Buckingham, the survey is used to jumpstart a discussion about what keeps your people up at night and what your firm should do or not do to continue to be successful. Get the right people on the bus, put them in the right seats, work with them to uncover the company’s core ideology and set everyone’s sights on a long-range, awe-inspring goal, then draft the roadmap that will lead you to the completion of that vision level mission… this is the strategy map. It is designed from the top down and implemented from the bottom up. The Discovery Team will be asked, “What financial benchmarks must we achieve in order to reach our goals?” Once an answer is identified, then it will specify what four or five benefits must be delivered to key customers to fuel those financial targets. The beauty of the strategy map is that it sets out in black and white the most important, measurable targets in each key area. 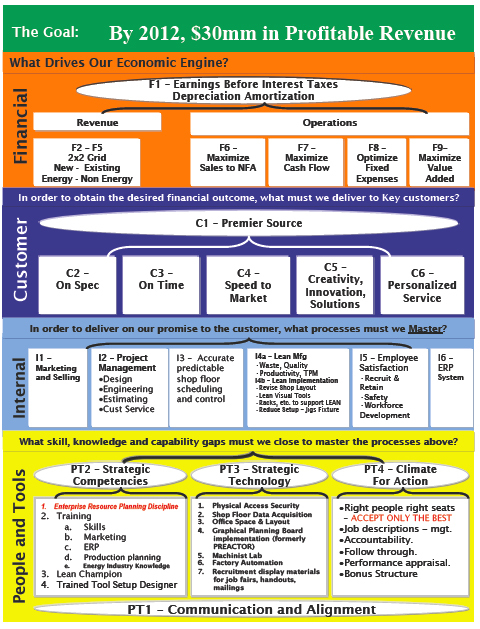 It is systematic and provides clarity of purpose for each individual in your organization. Managers spend so much time working “in” their business, they have little time to work “on” it. And even after making a commitment to look to the future, the skill sets and experience needed may not be at their fingertips. So when management attempts to facilitate on their own, they often bring their own internal agenda to the sessions. In other words, there is too much baggage and not enough trust that the results will be objective. TMG will help the Discovery Team uncover the company’s core ideology, and then help set goals and measurable yardsticks to track success. Since we are professionals from outside your organization, the results are often more readily accepted. 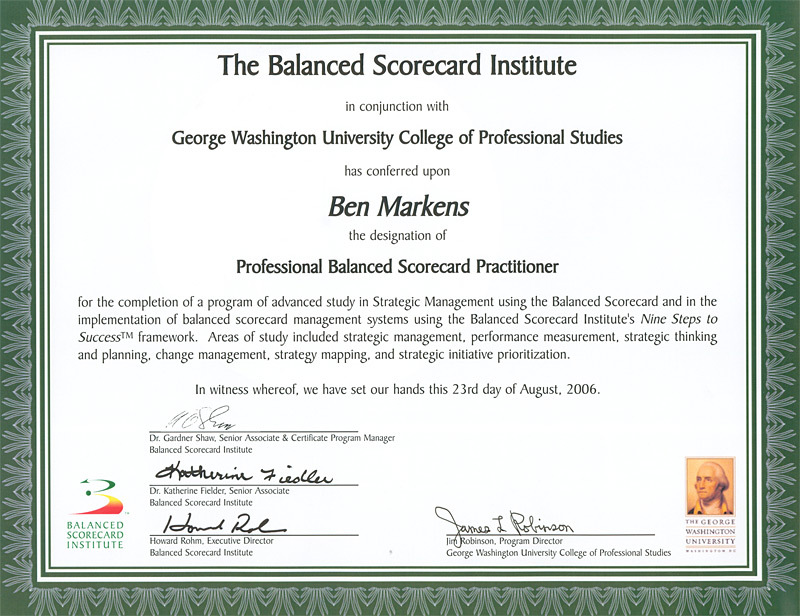 The Balanced Scorecard is a framework that helps organizations translate strategy into operational objectives that drive both behavior and performance. It is a practical road map for the implementation and management of both strategy and change. It is driven by the company’s vision and its goals for the future. Finally, it is a set of performance metrics that contain both leading (predictive) indicators and lagging indicators (like profit last period). Together they provide a structure for creating value. Perform a situational analysis of existing strengths, weaknesses, opportunities and threats. Identify the three to five critical issues which the company must get right to flourish. Hone in on the single most important strategic issue and set goals to address it. Create a Balanced Scorecard (what are we going to accomplish, who is responsible for effecting each change, and what are the deadlines for completion. The small to medium-held corporation is more than likely a family business. But whether or not the owner’s children are involved, a thoughtfully constructed strategy for the continuing management of the company will assure a smooth transition. TMG can help you prepare an ordered plan so that the long-term goals for your company continue to be met even after the quarterback is spending more time on the sidelines than on the field. A plan for grooming the next leader should be clear, specific, and public—all your employees are especially watchful during this time, and morale will stay high when everyone knows that management is concerned about continuity.